Bahrain’s Turk Mechanical lndustries (TMI) fabricated and shipped recently five mild steel tanks for a plant that Midal Cables is setting upin Africa. The emulsion and quenching tanks delivered to Midal Cables International LDA, Mozambique, had a maximum length of 11 m and a maximum width of 3 m, said a company spokesman. This is not the first time TMI has executed an order for Midal Cables. Four years ago the company fabricated a tilting furnace for Midal’s plant in Bahrain. TMI is one of the key Bahraini suppliers to local companies such as Alba, Garmco, Asry and GPIC. For Alba the company has fabricated from time to time items such as tapping tubes, end tubes, goose necks and impellers. It has also successfully completed shut-down projects at Alba and Bapco. TMI supplied several fabricated items for the Maaden aluminium plant in Ras Al Khair, Saudi Arabia, including fume ducts, bins and skips, metal platforms and tools for potline operations. “The challenge was that the contractor Bechtel brought forward the delivery time by four months which required us to revamp our workforce and source additional manpower and equipment. The new deadline was met successfully,” said the spokesman. TMI says its business has been hit severely because of traffic delays at the Bahrain-Saudi Causeway. Saudi Arabia is an important market for TMI with Oman being another main overseas destination for its products. The company has fabricated material for the Kitimat modernisation project in Canada and for steel maker Al Tuwairqi in Saudi Arabia. 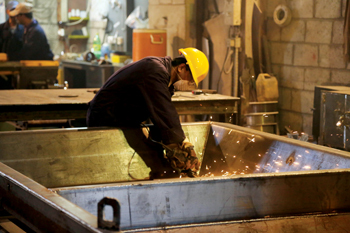 Established in 1985, Turk Mechanical Industries has specialised in all types of heavy and light fabrication, ferrous and non-ferrous castings, machining and engine re-building. It is certified to ISO: 2008 for quality management and Ohsas 18001 2007 for occupational health and safety. With the Gulf on the threshold of large-scale infrastructure development, TMI is keen to explore the business potential in Saudi Arabia, the UAE, Kuwait and Oman and is working on opening operational offices in those markets, the spokesman said.